From the towering Andes to the dense Amazonian rain forest, Ecuador is incredibly diverse. 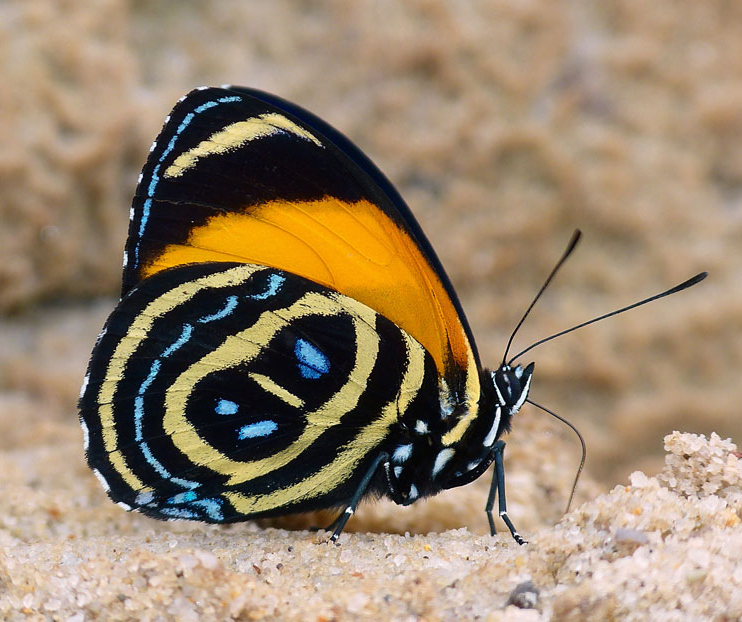 With about 4000 species of butterflies found within its relatively small borders, Ecuador is arguably (by surface area) the butterfly capital of the world! Approximately 2000 species of butterflies have been seen in the areas we will visit in the south and southeast of this remarkable country. 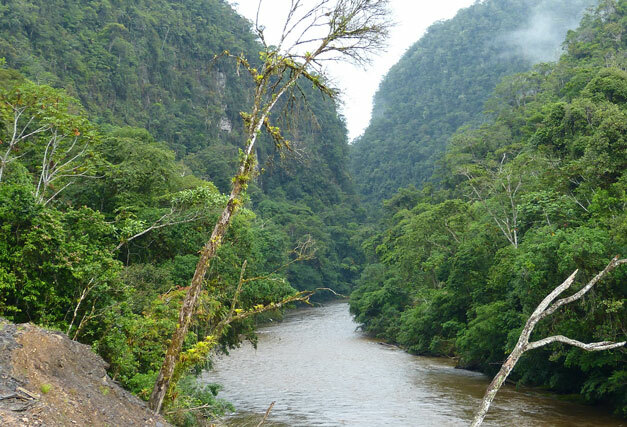 This area of Ecuador is a melting pot where unusual southern Andean species mix with those we are more familiar with from the north of the country, and the area is home to an impressive number of endemic species and subspecies. Day 1. The tour begins this evening at the airport in Quito, Ecuador. We will spend this night at a very comfortable hotel. Night in the Quito area. Day 2. This morning we catch an early flight South to Catamayo airport near Loja, arriving in time for a late breakfast, and still with a whole day of butterflying available to us. After eating we will proceed towards Zamora, passing initially through farmland and dry Tumbesian arid scrub, and then crossing over the Continental Divide as we clear the pass on the main road at 2800m, and descend through progressively taller and thicker forest into the wild and picturesque valley of the Zamora river. At 1600m elevation we will divert from the main road onto the higher end of the lower section of the old Loja-Zamora road (see notes below), crossing the river and exploring some stream-side trails. We will work our way down the road, stopping to explore the banks of various streams which traverse the road, eventually crossing back over the river to the main road at around 1000m, only 20 minutes from our hotel, where we spend the next three nights in comfortable individual wooden chalets surrounded by gardens full of flowers and hummingbird feeders. Overnight south of Zamora. Days 3 and 4. Our hotel is conveniently located on a quiet unpaved forested vehicle track about 2 kms south of Zamora town, in the Bombuscaro river valley. Customers can quickly and easily access this track directly from the lodge and walk the road when they have free time. There are also a number of excellent (but steep) forest trails within the extensive grounds of the lodge which you are free to wander. Many lovely butterflies are found on their property, including large owl-butterflies and morpho species such as Common Morpho (Morpho helenor), but also the spectacular white-topped Short-tailed Morpho (Morpho theseus). 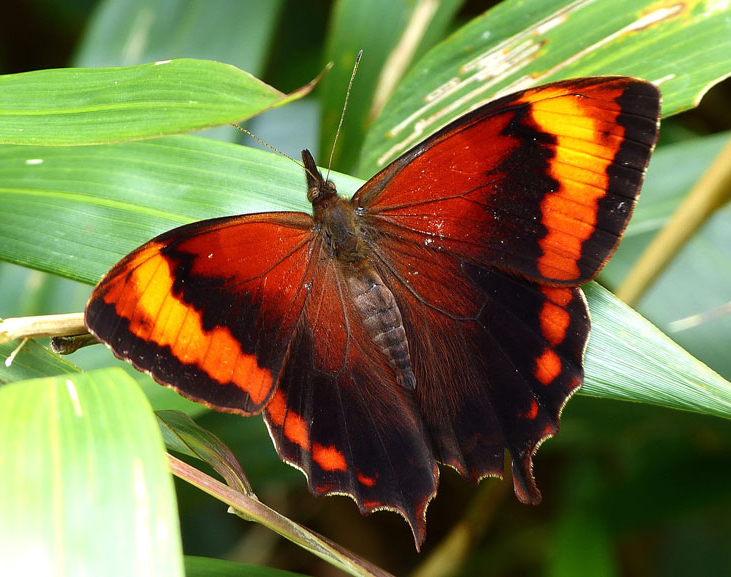 During our stay here, we will visit a number of wonderful sites for butterflies, mostly within an hour of the lodge. Your leader will choose from the following depending on weather conditions and the level of success we enjoy at neighboring sites. They are presented based on geographical location, and not in any particular order of hierarchy. Some sites will be visited on days 3 through 5 and others on days 9 through 11 (see below). Overnight south of Zamora. Bombuscaro entrance to Podocarpus National Park: Our hotel is located near the entrance to this park, considered to be one of the most important faunal reserves in the Andes. We will slowly walk sections of this unpaved vehicle track, especially two areas near a stream and a waterfall, where many species of butterflies puddle. At the end of the track we reach the park entrance, where a wide and well-maintained graded path (with firm footing) at around 1,000 meters in elevation leads into one of the few places where the visiting butterflier can access pristine, untouched, foothill forest. We can expect to see large numbers of daggerwings and emperors, including Cyan Emperor (Doxocopa cyane), Turquoise Emperor (Doxocopa cherubina) and Orange-striped Emperor (Doxocopa elis), large and showy purplewings, including Dark Purplewing (Eunica alcmena), Small-eyed Purplewing (Eunica eurota) and Frosted Purplewing (Eunica caralis). Baeotus species, large ithomiines including Methona and Melinaea, several heliconians including both blue and red Dot-bordered Heliconians and local subspecies of Erato Heliconian, Tragic Heliconian (H. melpomene) and Yellow-ringed Heliconian (H. xanthocles), all with much redder upper surfaces than those familiar to us from further north in the Tena area, several beautiful Pyrrhopyge and Jemadia firetips, the large mimetic Clearwing Mimic-Queen (Lycorea ilione), and many gaudy metalmarks including Blue-bordered Metalmark (Necyria bellona) and several species of beautymarks (Ancyluris) and jewelmarks (Anteros), among many others. Ridge top path: This is a spectacular site – a ridge top path through sections of quality cloud forest where we can see many wonderful endemic and rare butterflies. The views are also spectacular. It’s undoubtedly one of the best butterfly sites we know anywhere in Ecuador. 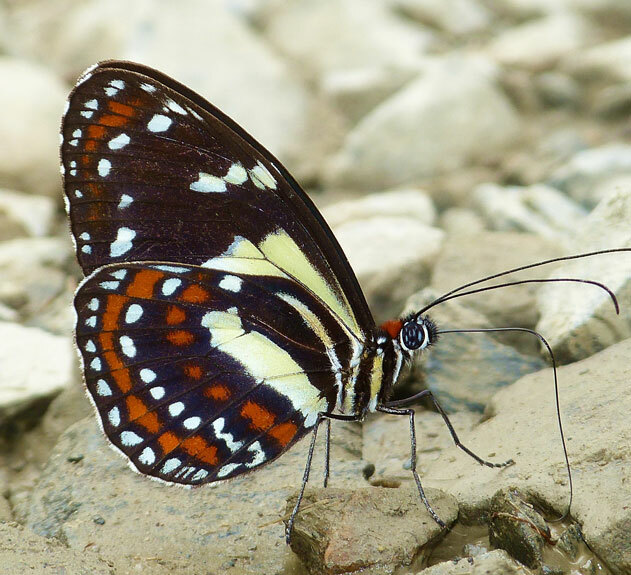 A selection of choice butterflies includes: various gossamerwings including Fractured Highstreak (Micandra platyptera) and Three-lined Elstreak (Laothus viridicans). Also present is the rare and desired Ecuadorian Clearmark (Chorinea gratiosa), Lilac-banded Sombermark (Euselasia perisama), Red-based Fiestamark (Symmachia fassli), Clearwing Mimic-White (Dismorphia theucharila), Gray-bordered Leafwing (Anaea acaudata), Lined Leafwing (A. lineata), and Felder’s Leafwing (M. anassa), several species of bannders including Pink-spot Banner (Epiphile orea), Reddish Purplewing (Eunica carias), East-Ecuadorian Heliconian (Heliconius timareta) and Yellow-costa Heliconian (H. congener), a rare and endemic actinote, Kenneth’s Actinote (Actinote kennethi), Angled Owlet (Opsiphanes mutates), Redbear-face Satyr (Mygona poeania), and the cool, Striped Ur-Satyr (Parataygetis albinota). Ridge track: This remarkable unpaved vehicle track, that we recently discovered, enters beautiful forest at around 1400m and continues upwards through cloud forest to over 2000m. We can expect to see similar species to those found on the ridge top path, but as this track continues for many hundreds of metres higher we expect also to see a larger diversity, especially of altitude-sensitive species such as periclouds (Perisama), dartwhites (Catasticta), and the pronophiline satyrs, including special species such as Twin-tailed Satys (Daedalma). A fabulous speciality here is the enormous Pale-spotted Morpho (Morpho amphitryon). We also hope to see the delicate Opalescent Morpho (Morpho sulkowskyi) with its dazzling mother-of-pearl upper wings. Old road from Loja to Zamora, lower section. This lower section has several forested stretches including corners with streams crossings, water courses along the road verge, and the bridge across the river Zamora itself. On the higher section of this lower loop of the old road there is an excellent streamside path. The path starts in streamside vegetation with secondary vegetation mixed with pasture to the uphill side, but after about 1km, the path enters thick forest for about 500m. 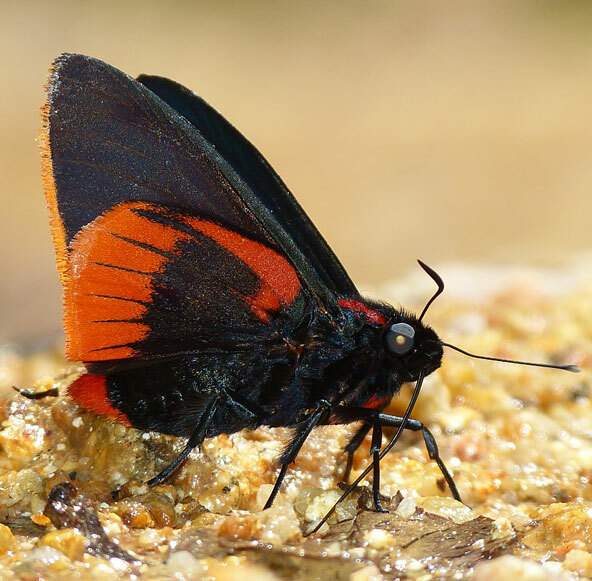 We hope to find a large cross section of local species but will undoubtedly see many colourful periclouds, banners, dartwhites, firetips and many other attractive species, and possibly even the rare endemic Ecuadorian Cattleheart (Parides phalaecus). Old road from Zamora to Loja, upper section: We can drive the first 2 or 3 kms of the upper section of the old road, but then we must walk a similar distance. The track is very picturesque, with a lot of flowers and pretty vegetation, and easy to walk. There are fewer species to be found at these high elevations, but those that do occur here are often rare or endemic, and so add an element of excitement to our searches. We hope especially to find some rare and beautiful pronophiline satyrs such as the stunning Marbled Junea (Junea doraete), plus sumptuous lasios (Lasiophila) species with their golden chestnut upper colors, and various montane hairstreaks and metalmarks. Day 5: We leave our hotel early as we have a 3-4 hour drive ahead of us to the fabulous Nangaritza valley in the far east, on the Peruvian border. We hope to arrive in the late morning in time to enjoy a nearly full day at Maycu reserve, with easy access and two long and enjoyable trails at around 900 m elevation. We cross to the east side of the wide river Nangaritza using a very long suspension bridge – this is great fun, and feels fantastically adventurous, especially given the epic setting with views upriver into the Nangaritza valley with vast tracts of forest-clad hills and mountains, swirling mist, and parrots flying overhead. On the far side of the bridge on our last trip we were greeted by a puddling male of the endemic and huge Peruvian subspecies of White-spotted Eighty-eight (Callicore excelsior). We were also greeted by several other eighty-eights and two Panaceas, always exciting to photograph, along with males of Wine-eyed Purplewing (Eunica Amelia) and Double-crescent Purplewing (E. norica), plus Orange-dotted Metalmark (Amarynthis meneria)and a few of the rather scarce Amazonian Crescents (Mazia amazonica). At this point you can choose which of two paths to take – one heads upriver, along the bank of the Nangaritza. It’s a lovely walk, with great forest. The second path heads east towards Peru (for many hours! ), following a tributary of the Nangaritza river. It has excellent forest and great butterfly habitat, and we might see Feathered Prepona (Prepona laertes), many ithomiine species including Oleria tigilla, the striking Sunny Sheenmark (Eurybia juturna), beautymark (Ancyluris) spp, Common Blue-Sombermark (Euselasia orfita), Brunette Eyemark (Mesosemia macella), potams (Potamanaxas) sp, Saliana sp., etc. We overnight at a basic but comfortable lodge in the Nangaritza Valley – it’s not much of a looker from the main road, but once inside it has a certain rustic charm, and the staff is friendly and welcoming, and the food is tasty even if not sophisticated. The lodge itself is located near the banks of the river Nangaritza, in its own private reserve with trails on the opposite side of the (unpaved) main road, with a forested stream valley. Its trails have steep climbs but these are initially quite easy with good forest butterflies to be seen here such as the rare Bolivian Narope (Narope cyallabarus), Satyrical Owlet (Bia actorion), White-signed Morphet (Antirrhea philoctetes), Orange-patched Phantom-Satyr (Pierella hyceta), Ochre-banded Blue-Satyr (Chloreuptychia tolumnia), Flaming Panacea (Panacea prola), Six-spotted Eighty-eight (Callicore aegina), Frosted Purplewing (Eunica caralis), Fiery Scarlet-eye (Dyscophellus porcius) and Plain Scarlet-eye (D. ramon). Day 6. We will explore the main road south to Shaime, driving slowly along the unpaved track and looking out for puddle parties and areas with good numbers of butterflies. We will concentrate our attention on the ascent and descent to Miazi, the descent to Shaime, and the bridge over the river Nagaritza, with views downriver of the beautiful Miazi canyon. Here there are extensive puddling areas along the river beaches, and beside the bridge, where concreted areas also attract many species. We hope to see many puddling pierids, especially Phoebis, several species of morphos, such as Sunrise Morpho (M. cisseis) and Falcate Morpho (M. rhetenor), swallowtails such as Androgeus Swallowtail (Papilio androgeus), and the spectacular Tigerwing Swallowtail (P. zagreus), We could also see all three species of panaceas, three Baeotus species, many eighty-eights (Callicore & Diaethria), sailors (Dynamine) and purplewings (Eunica), including Arrowhead Purplewing (E. phasis) various greenmarks (Caria) and bluemarks (Lasaia) as well as other metalmarks. Overnight at an adequate hotel in the Nangaritza Valley. Day 7. We plan to visit a ridge top path that extends for about 2 kms through thick forest. 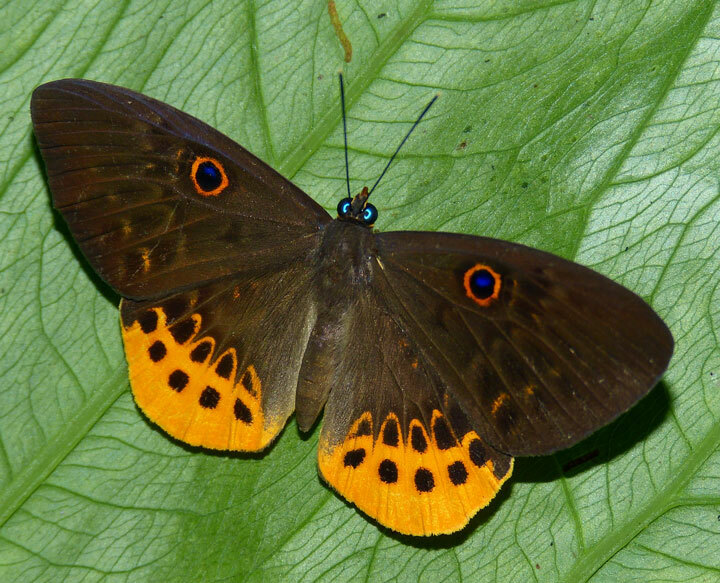 In addition to the more common species, we previously saw the outstanding Three-spotted Eyemark (Mesosemia eumene), massive Plain Owl-Butterfly (Caligo eurilochus), always popular Blushing Phanton-Satyr (Cithaerias cliftoni), leafwings, and dainty Agatha’s Blue-Satyr (Chloreuptychia agatha). Overnight in the Nangaritza Valley. Day 8. Today we return to our hotel south of Zamora, but on the way we stop to revisit Maycu Reserve (see above) until the early afternoon. Overnight south of Zamora. Days 9 & 10. See notes for Days 3 and 4 – we revisit our favorite sites around Zamora. Nights south of Zamora. Nights south of Zamora. Day 11. Today we will dedicate our time to the old Zamora-Loja road (see notes above for Days 3 and 4), leaving in the early afternoon to move on towards our next lodge in an arid valley near Yangana. This lodge has the added advantage that in your spare time before and after our day trips you can stroll into a small private nature reserve alongside it. The reserve is located in a stream valley with semi-deciduous dry and humid forest which has taken over an old coffee plantation, now overgrown and with plenty of other vegetation. 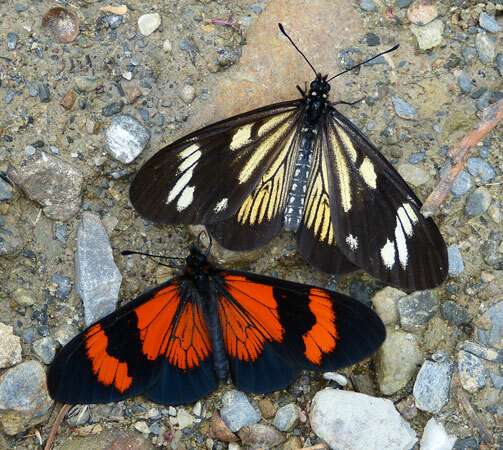 Here we might see the endemic West-Andean Heliconian (Heliconius himera) and the fabulous Harlequin Ticlear (Elzunia pavonii), and even find them puddling on the dirt road from about 10:30 until 11:00. There are also many ticlears (ithomiines) in the forest. The road immediately outside the lodge runs through dry forest and farmland with exotic Eucalyptus trees, but despite such unpromising vegetation there are a few short patches of more humid forest where butterflies gather, and a stream crossing with good gravel and stone beaches. Along with the more common butterfly species, we can find the exceedingly unusual endemic Smoky Eighty-eight (Diaethria ceryx), Tithian Sailor (Dynamine tithia), plus a few hairstreaks, including Red-looped Dreamstreak (Erora badeta). Overnight in comfortable cabins in Yangana. Day 12. Today we will work the unpaved vehicle track to near Yangana. The first 9kms are through very dry deciduous and semi-deciduous vegetation (with few butterflies), but then we enter beautiful cloud forest at around 2500m and continue up into elfin forest and then paramo moorland (with remarkably diverse and beautiful vegetation) at over 3000m. The flowers and trees are stunning (with many orchids and bromeliads), the views are spectacular, and we may see a great many species of pronophiline satyrs including many falcon-satyrs (Corades), pronosatyrs (Pronophila) including the very rare endemic Ecuadorian Pronosatyr (P. isobelae), many pedalios (Pedaliodes) species. We see stunning mosaic-patterned junea species and large numbers of actinotes, including the localized Radiant Actinote (Abananote radiata). Other butterfly groups that are well represented include mapwings, a number of whites such as tilewhites (Hesperocharis), leowhites (Leodonta), and dartwhites, unusual hairstreaks such as Ruddy-frosted Andean-Elfin (Penaincisalia loxurina), and skippers, principally dainty skipperlings. This site is a joy to visit and we can easily spend a whole day here. Overnight in Yangana. Day 13. Today we plan to visit an excellent site near the village of Valladolid, south from Yangana. This was your tour leader’s favorite site on his scouting trip, where he saw many superb butterflies. 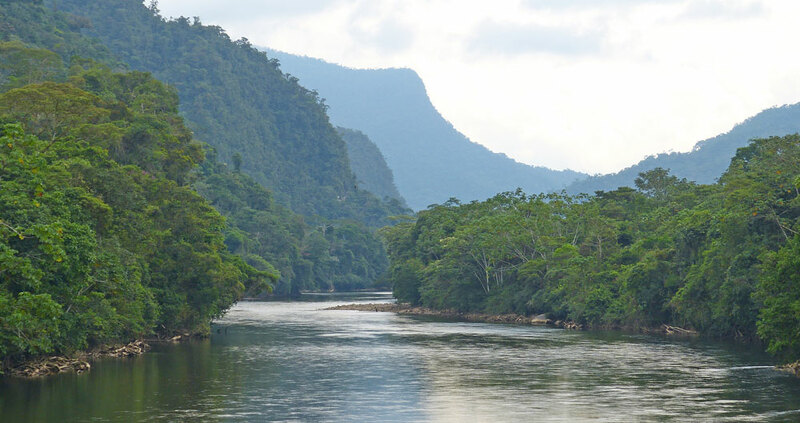 However, no pain, no gain, as they say – to get to the site requires a gentle 30-40 minute (1.5 km) hike upwards (ascending about 180 m from a start at 1625m) alongside a pretty river through pastureland with small stands of vegetation (yet still with some butterflies to view). The path runs over mostly solid ground with patches of mud. It’s possible to do this in low ankle boots, but if it has been raining we advise you to bring rubber boots, and those unsteady on their feet will benefit from hiking poles. Then we enter 3 stretches of very good forest and the fun begins. The target species for the day is the highly localized and very pretty cloud forest White-traced Heliconian, (H. Hecuba), which is common here. We also hope to see the very pretty Cherry-barred Heliconian (H. telesiphe) (white-banded here, rather than the more familiar yellow-banded). Some of the more attractive species we are likely to see include: leafwings, banners, periclouds, sailors, and sisters. We may see many species of mimic-whites and dartwhites, many ticlears (ithomiines), several hairstreaks, including greatstreaks, the heart-stopping Tricolored Beautymark(Ancyluris formosissima), many large skippers including Brilliant Firetip (Pyrrhopyge zereda), Orange-lead Firetip (Pyrrhopyge martena) and White-bordered Firetip (Pyrrhopyge aziza) Overnight in Yangana. Day 14. Today we return to Catamayo airport, near Loja, for our late afternoon flight to Quito. However, we shall stop off en route at the conveniently-located entrance to Podocarpus National Park. We will walk the final two kms (about 5.5 km distance from the entrance gates) through elfin forest at 2650 – 2700m elevation. There are wonderful views and plenty of stunning flowers to admire. 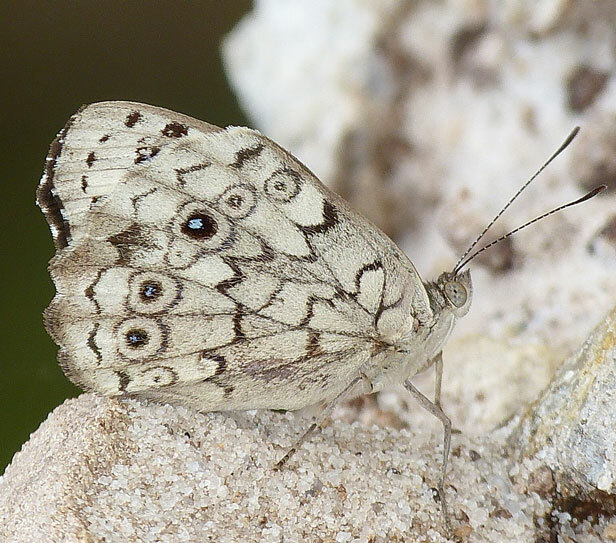 Butterflies are plentiful, albeit mostly pronophiline satyrs, especially falcon-satyrs, species such as the pretty Cell-spotted Falcon-Satyr (C. chirone), White-spotted Falcon-Satyr (C. iduna), and Many-spotted Falcon-Satyr (C. dymantis), plus rare Two-faced Lyman (Lymanopoda caracara), the endemic Rusty Penrose-Satyr (Manerebia rufanalis), dramatic Flaming Laio (Lasiophila phalaesia and several fabulous big satyrs including Ecuadorian Pointed-Satyr (Apexacuta orsedice) and Mossy Junea (Junea dorinda). 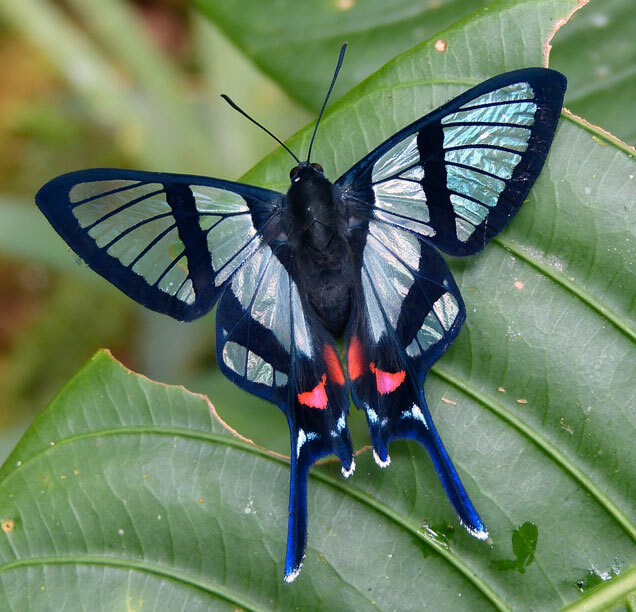 Also (if we are lucky) we might see a remarkable Cloud-banded Swallowtail (Papilio cacicus). It often clouds over here in the early afternoon, but this should not trouble us since we need to leave around 13:00 to allow ample time to catch our flight back to Quito. Overnight at our very comfortable Quito hotel. Day 15. The trip ends this morning at Quito airport. Leader will be Andrew Neild, an experienced butterfly tour leader and author of Butterflies of Venezuela. Cost of the trip TBA from Quito. Cost includes double-based accommodations, meals (except, because of staggered arrival times, dinner the first night), ground transportation, airport transfers, tour leader fees and entrance fees. Not included are alcoholic beverages, laundry services, and other items of a personal nature. Single supplement is $TBA. This trip is limited to 8 participants.